While increasingly present in our daily lives, the Internet is a very young medium and is still in its experimental stage. Technology is continuously improving every day and companies have to quickly adapt to the new changes. One of the most challenging aspects is that the consumer is able to adapt to the new media much more quickly than the companies that should be using it in the first place. The world is just beginning to realize the potential of the Internet, which offers a perfect medium for spreading creative ideas that are already changing the world. The digital media revolution has had a profound impact on brand strategies (Hoffman, 2000) – the field of branding being, without any doubt, one of the most dynamic and fast-moving fields in marketing today, mainly due to the social media revolution. While the dos and don’ts of branding through social media are still in their infancy in the Western world, the Eastern post-communist space presents itself to branding professionals with even more challenges, determined by consumers unaccustomed to product differentiation, that were forced to skip important evolutionary steps in order to understand the modern marketing world (Bogdan, 2010). However, the unique position of these markets offers insights that can easily be transformed into immense advantages. This paper is aiming to offer branding professionals unique angles of analyzing an issue that is not yet sufficiently investigated, by addressing the research gap through lessons gained from valuable case studies. Throughout the paper, both challenges and opportunities for online branding in a post-communist space will be assessed – on one hand, by using the concepts and information the literature is providing, on the other, by analyzing the cases of two Romanian brands from the communist era, ROM and Pegas, which have been reinvented and re-launched in a capitalist economy, using strategies that involved online tools. The Social Web is redefining and reconstructing branding approaches and models (Fournier and Avery, 2011). Through the revolution of the dynamics of branding, consumers are able to influence a company’s messages and product assortment (Hanna et. al, 2011) and can actively contribute to their improvement. Therefore, the social media revolution has made is more important and urgent than ever to ensure the proper delivery of the brand promise (Barwise and Meehan, 2010). Investments in building the brand using online tools are justified by the creation of a resonance with the company’s customers, determining them to actively seek for the brand’s messages and ultimately become loyal. Marketers need to prioritize these kinds of actions and see them as long-term revenue creating activities (Wallace, 2010). The adaptation to such an environment - characterized by speed, opportunity and change - came slowly for Eastern European brands. Therefore, only a handful of local companies used to define branding as something more than logo, packaging and advertising (Bogdan, 2010). It is challenging to understand that online success is not only guaranteed by the proper use of social media tools, but highly depends on the integration of the brand promise at every consumer touch point (Barwise and Meehan, 2010). Therefore, one of the most important aspects and challenges of building a successful brand online is a clear understanding of that brand’s audience, before the development of any further strategy. This constitutes a solid foundation that leads to well-targeted messages. As Barwise and Meehan (2010) argue, the true value of social media in branding is not in the immediate selling or promotion, but rather in gaining valuable insights about a company’s customers. In today’s world, brand managers can no longer fully control the reach of the company’s messages – rather, consumers have this kind of power. Along with this, branding has become, in many cases, an open source activity (Fournier and Avery, 2011), in which anyone can have a say in an ongoing online conversation about the brand’s attributes and behavior. Stories and storytelling represent a powerful tool used to create connections with the brand by allowing consumers to correlate their own experiences with the brand story (Singh & Sonnenburg, 2012). However, good brand management ensures that the consumers’ brand stories remain as close as possible to the original one. Such brand narratives can be triggered through the creation of tension (Singh & Sonnenburg, 2012) – inciting incidents arising from the brand’s history, archetypes or cultural values, as it will be illustrated in the ROM and Pegas case studies. Social networks represent the ideal tool for creating online word of mouth. In comparison with the traditional one, that offered little control, but at an almost inexistent cost, e-WOM requires a communication strategy that is constantly supported and invested in with time and human resources. However, its interactivity and rapidity make it an appealing instrument for creating brand awareness, complementing the company’s initiatives related to traditional marketing channels (Armelini and Villanueva, 2009). The ultimate purpose of online branding could be seen as the creation of connections among members of the community, in order to ensure the perpetuation on online word of mouth (Hennig-Thurau and Walsh, 2003). According to Krishnamurthy and Kucuk (2009), anti-brand websites and complaint forums are tools that consumers use in order to focus negative attention or to provide information on a specific brand that dissatisfies them. On the other hand, Cova and Pace define brand communities as the “group of people that posses a common interest in a specific brand and create a parallel social universe (subculture) rife with its own myths, values, rituals, vocabulary and hierarchy.” In the two case studies, it will be demonstrated how both of these actions can eventually lead to positive results. A specific challenge for branding in post-communist countries was making the consumers, accustomed to only one product per category, aware of the fact that they may choose among a multitude of promises and levels of quality. An enormous opportunity arose – almost any product that was successfully distributed would become also a success in terms of sales – without the help of any promotion or branding. However, the availability and accessibility of information of the internet changes this and forces contemporary brands to be authentic and transparent, making sure that its brand promise and behavior are perfectly aligned (Fournier and Avery, 2011). Until the social media revolution, a powerful imbalance was characteristic to Eastern European markets– global brands managed to deliver their promise, but failed in sociologically and culturally understanding the customers, while local brands were closer to the cultural emotions of their target but failed to constantly deliver the promise (Bogdan, 2010). However, after a period when global brands became more and more successful, increasing the competition, determining many local brands to disappear, a trend of coming back to old-fashioned products can be observed all over Eastern Europe (Berkowitz, 2006). The nostalgia is determined by the consumers’ sense of patriotism, desire for uniqueness and memory triggering. According to Dr. Christian Duncker, from the Empircal Social Research group in Hamburg, the new success in the online media of surviving products from the communist era is mainly caused by the “retro trend”, making such brands more appealing. Even though the end of communism marked the beginning of a new philosophy of consumer choice in Eastern European markets, there are still many brands that, either by relying on tradition or on reinvention, have a success story to tell. The non-conventional approach was then taken to the next level. In times of political and social instability, young Romanians no longer took pride in their nationality; moreover, according to studies by McCann Erikson, almost 80% of them wanted to leave the country, thinking that they can achieve something only by emigrating. It was not the ideal situation for a chocolate with the national flag on it. Using this insight, ROM chose to challenge their national ego. Therefore, the Rom chocolate was launched under a new packaging, using the American flag, the communications in online media started to be in English, under the slogan “The taste of coolness” (Dumitrescu, 2010). Annoying social media messages, that indicated to the American takeover, lead to a unique phenomenon: people assaulted ROM’s website, defending the Romanian flag values, and old packaging. The results? Over 100 Facebook pages that were complaining about the rebranding, over 10 online petitions, a group with more than 11.000 members, YouTube videos that were mocking the new packaging and even a flashmob. Luckily, after one week, it was revealed that this was only a teasing campaign for the actual rebranding – as requested, ROM returned to its initial packaging and slogan, bearing strong patriotic messages. In the first week only, the campaign reached 67% percent of Romania, mainly through online channels, and it generated EUR 300.000 worth of media appearances and Facebook fans rose by 300%, leading to gaining the old position of “most popular chocolate bar”. Therefore, by correctly using insights specific to East-European markets, an ex-communist brand managed to become market leader and to reconnect with the public through an award-winning campaign (two Grand Prix Lions in Cannes) that targeted young people and used the media of communication specific to them – Facebook, Twitter and website interaction. 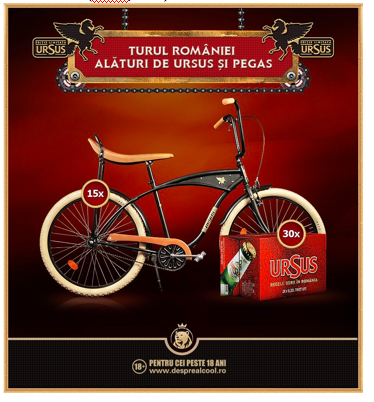 Moreover, the online buzz created around the brand attracted Ursus, Romania’s largest beer producing company. Ursus saw the re-launch of the brand as an opportunity to endorse a 100% local brand and to participate in rebuilding its success (Kubis, 2012). Therefore, they created a Facebook campaign that encouraged consumers to participate in a virtual bike-ride, raising awareness regarding cherished Romanian values – the application having over 30000 users that supported the collaboration (Vidru, 2012). The re-launch was a success, the Pegas bikes currently being sold online and offline, and steadily becoming a must-have urban item. In the business world, there are still many differences between East and West. One of those differences is how branding is approached, both by marketing professionals and consumers. While general rules as the power of communities, storytelling and crowdsourcing are globally applied, Eastern European markets need specific insights that deal with consumer values and specificities. The transition from communism to consumerism lies in the efficient use of tools that the online branding landscape is offering. Through targeted communications, using the relevant channels for today’s fast-moving online world, even traditional, ex-communist brands can write valuable stories through successful reinventions. Atelierele Pegas. (2012). Atelierele Pegas. Available: http://www.bicicletapegas.ro/. Last accessed 20th Feb 2012. Armelini, G & Villanueva, J. (2011). Adding Social Media to the Marketing Mix. Deep insight. 9 (2), 29-36. Barwise, P & Meehan, S. (2010). The One Thing You Must Get Right When Building a Brand. Harvard Business Review. - (12), 1-5. Bogdan, A (2010). Branding pe frontul de Est. Bucuresti: Brandient. Christodoulides, G. (2009). Branding in the post-internet era. Marketing Theory. 9 (-), 141-144. Cova, B & Pace, S. (2006). Brand community of convenience products: new forms of customer empowerment – the case “my Nutella The Community”. European Journal of Marketing. 40 (9), 1087-1105. Crossland, D. (2009). Feeling 'Ostalgie' for communist-era brands.Available: http://www.thenational.ae/news/world/europe/feeling-ostalgie-for-communist-era-brands#page1. Last accessed 20th Feb 2012. Dumitrescu, C. (2010). Romanian brands survive capitalist transition through reinvention. Available: http://business-review.ro/tech/romanian-brands-survive-capitalist-transition-through-reinvention-10297/. Last accessed 20th Feb 2012.
, , S & Avery, J. (2011). The uninvited brand. Business Horizons. 54 (-), 193—207. Hanna, R, Rohm, A, Crittenden, V. (2011). We’re all connected: The power of the social media ecosystem. Business Horizons. 54 (-), 265—273. Hoffman, D.L. and Novak, T.P. (1996) ‘Marketing in Hypermedia Computer-mediated Environments: Conceptual Foundations’, Journal of Marketing 60(3): 50–68. Krishnamurthy, S & Kucuk, U. (2009). Anti-branding on the internet. Journal of Business Research. 62 (-), 1119–1126. Kubis Interactive. (2012). Ursus Pegas. Available: http://kubisinteractive.com/case-studies/ursus-pegas/. Last accessed 20th Feb 2012. Singh, S & Sonnenburg, S. (2012). Brand Performances in Social Media.Journal of Interactive Marketing. 2006 (-), 189–197. Schweizer, K. (2006). Old Communist brands don't die, they go 'retro' . Available: http://www.nytimes.com/2006/10/26/business/worldbusiness/26iht-east.3300363.html. Last accessed 20th Feb 2012. Wallace, C. (2010). 5 Key Strategies To Build Your Brand Online.Available: http://searchengineland.com/5-key-strategies-to-build-your-brand-online-39420. Last accessed 20th Feb 2012.